Quebec City’s Le Chateau Frontenac, a Fairmont property, is the most photographed hotel in the world. This year, it’s celebrating its 125th anniversary with an entire year of festivities. I was fortunate to be invited to the opening night of the anniversary merriment. 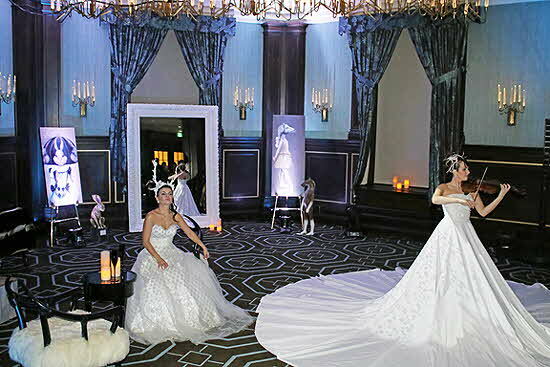 The hotel pulled out all the stops with a party that spanned several rooms. One of the highlights was a projection show that told the story of the Château's history, including fires that the building suffered in years past. In another room, a woman played the violin in a white gown with a hoop skirt that also displayed projections. Of course, there was lots of food and drink, including a pink room filled with colorful dessert confections. Throughout it all, an actor in period dress kissed hands as the flamboyant French governor Count Frontenac, whose name the hotel bears. Count Frontenac was governor of New France in Quebec from 1672 to 1698, and his coat-of-arms is seen throughout the hotel. The site of the hotel, in fact, is where New France and Canada were born 410 years ago. The opening party was just a glimpse of what’s to come throughout 2018 for the Château's anniversary. 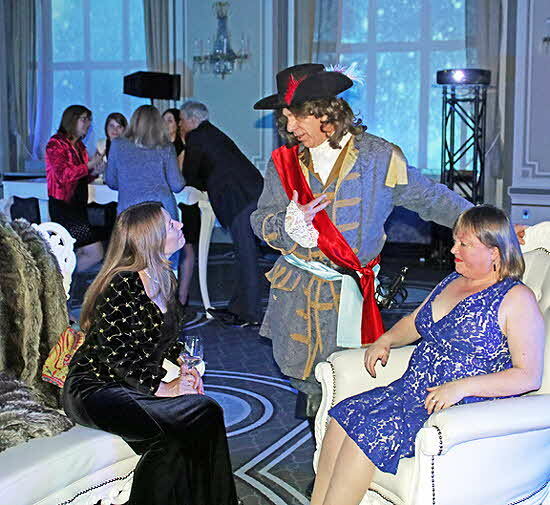 A special opera will be performed on site in March, and April’s springtime celebrations will include a chocolate festival and the premiere of an anthem written especially for the Château by Canadian composer Steve Barakatt. It will be the first anthem written for a hotel. On April 23rd the Château will unveil eight heritage suites named after prominent people who have stayed there - Winston Churchill, Princess Grace, Charles de Gaulle, Queen Elizabeth, Alfred Hitchcock, President Franklin D. Roosevelt, and Celine Dion, who got her first recording contract after a performance at the Château. The eighth of these suites will be called “Trudeau & Trudeau” and will include memorabilia of both prime ministers Trudeau, Pierre and Justin. The Château will celebrate Canada Day on July 1st and Quebec City’s 410th anniversary on July 3rd, complete with giant anniversary cakes. Both of these events will be free and open to the public. In August, there will be a Murder Mystery Supper, as well as a meeting of chefs that will include 11 First Nations chefs partnering with 11 culinary chefs from Quebec. The Harvest Festival takes place in September, and November will bring an open house and an exposition of the hotel’s memorabilia. Christmastime will include the 50thanniversary of Princess Grace’s visit to the Château and the 100th anniversary of the end of World War I. The 125th anniversary year will end with a huge bash to end all bashes on December 18th. Staying at Le Château Frontenac is an experience to remember. 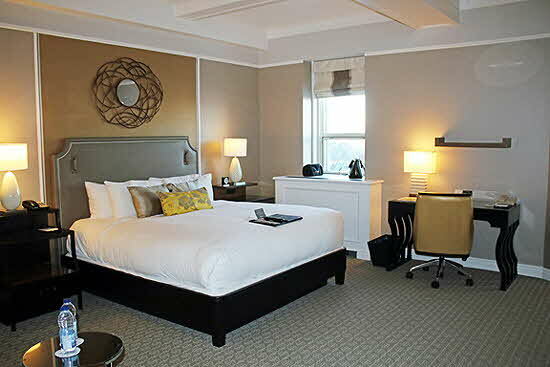 It sits next to the St. Lawrence River in old Quebec City, which is an UNESCO World Heritage Site, and some of the rooms have views of the river. In winter, you can watch the ice floes drift in one direction and then switch directions with the tide. There are 611 guestrooms and suites. Mine was a Signature Room, which had its own separate corner seating area. The décor was in yellow and gray with the chairs in stripes of those colors. I had a separate desk, and one of the bedside drawers contained the room’s safe. I especially loved the small adjustable reading lights that were built into the padded headboard. It was also fun to find my name on the labels of the bathroom amenities, which smelled of rose. Just walking around the hotel is a feast for the eyes and includes numerous historical artifacts and vintage photographs. You can download the hotel’s app to learn about the property’s history as you walk around. Of course, the Château has a full-service spa, health club with a pool, hair salon, upscale shops, and ample meeting space. For dining, you have plenty of choices. Champlain Restaurant serves new Quebec cuisine by Chef Stephane Modat for afternoon tea and dinner. The dishes include lots of local seafood and unusual fare like red deer tartar, Lapland caribou, and blackcurrant mousse. Bistro Le Sam serves lunch and is open late for drinks. 1608 is the hotel’s wine and cheese bar, and Place Dufferin is where you’ll have your breakfast. The location of this restaurant is particularly special because it overlooks the St. Lawrence River with large picture windows. It’s one of the best views you’ll ever have while you eat your eggs and croissants. 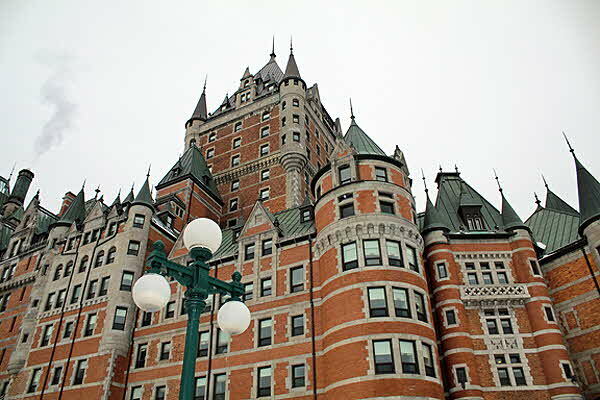 Maybe I’m partial to French architecture, but in my opinion, Quebec is the most beautiful city in North America, and Le Château Frontenac is its crown jewel. So if you’ve always wanted to stay at the iconic Château, I recommend trying to do it this year during all of these special activities, but rooms will probably go fast. Check out the 125th anniversary schedule to decide what you’d most enjoy during your visit, and make your plan ASAP.